Back in August, I had the privilege of hearing Scott Berkun speak. If you don’t know who he is, you should. He regularly shares nuggets of wisdom that reveal a man that not only seeks to learn from research and experience, but can also merge the two into solid advice. When I saw him speak at the DC User Experience Professionals Association meeting, he was talking about his book Mindfire. He was giving out free copies to those that participated in the presentation/discussion. When I “earned” my book, I traded for The Myths of Innovation. An earlier book of his, it is one that gets to the root of why I listen to Scott Berkun. Enough prelude, let’s talk about the book. 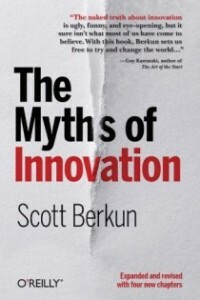 In The Myths of Innovation, Scott tackles many of the “Myths” that people have about innovation. Actually, the myths are about old innovations that he dispels while demonstrating that the assumptions about innovation that people have drawn from those myths are not true. This isn’t to say that he discounts the efforts or accomplishments of Isaac Newton, the Wright brothers, or Steve Jobs. On the contrary, he essentially gives them more credit because the facts around their myths reveal the real work and effort that went into their advancements. In fact, one thing that Scott stresses is that innovation is work. It does not come in an epiphany unless the proper groundwork has been laid. That flash of insight is likely the result of a lot of effort that culminates when the subconscious decides to release the results of its efforts. Scott does more than smash myths and misunderstandings, he clearly explains the reality behind each concept with examples drawn from both history and modern day companies. These real life examples help illustrate how much work innovation is and how even then it sometimes isn’t enough. One thing that Scott points out is something that I’ve heard many people observe of late…the word ”Innovation” is over-used. We cannot force innovation. We can enable creativity among ourselves and our colleagues. What comes out of it may be innovative or it may just be simply new and useful. You can set out to be innovative, but success depends upon your output, not just your efforts. You do have to work at it to have a chance, as everyone has in the past, but true innovation can be elusive. I’ve created a lot of cool things in my time, solving some tough problems. Were they innovative? Maybe? If they were, they were limited in scope. That doesn’t make me less proud of what I’ve done. My accomplishments are the same that they’ve always been. Innovative? Maybe not. Read it. If you want to foster creativity in the hope of doing something truly innovative, read this book. It offers ideas and helps you to take a different angle as to what is required to enable creativity. I think one of the most important lesson is that there is no single formula. What helps be be creative won’t necessarily work for my colleagues. As a leader, if I want my staff to be creative, I have to create an atmosphere where they can feel free to try new things and collaborate in an environment that works best for them and not myself.